Waders soak in a pools a Berkeley Springs at Bath, West Virginia. Of all the wondrous healing springs in West Virginia, no other enjoys quite the pedigree that Berkeley Springs can claim, which is why it’s among my favorite day-trip destinations. History, scenery, and hospitality blend beautifully here in the shade of Warm Springs Ridge, and there’s much to see and do, whether or you plan to wade or wander through cafes and specialty shops. 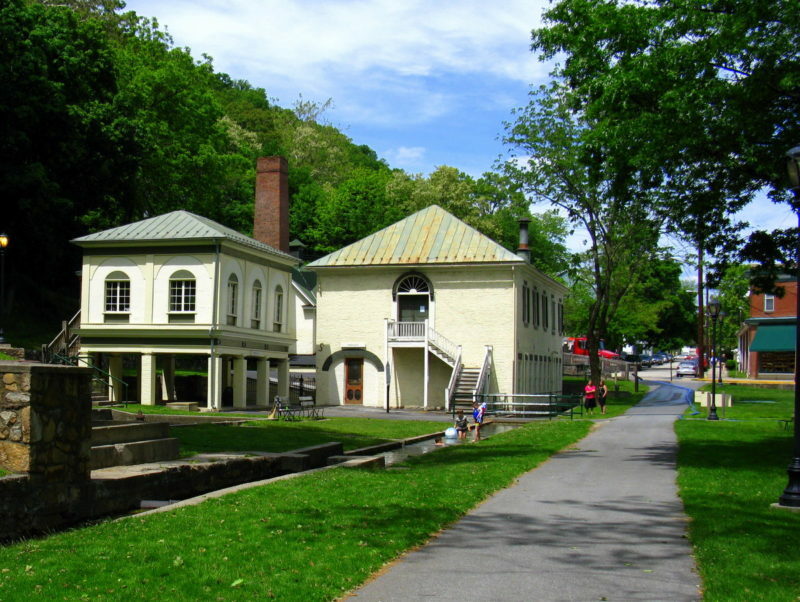 Unlike many other regional springs, the springs here in the town square are publicly owned and have remained so since 1776 when Lord Fairfax deeded the property “to the publick for the welfare of suffering humanity.” Now managed as Berkeley Springs State Park, one needs only to stroll across a green lawn to soak in any of the public wading pools, into which water bubbles at a constant 74 degrees. No admission fee is charged, though fees are charged to swim in the larger treated swimming pool near the center of the square or indulge in any of the spa services, including the park’s Roman baths. Established informally as a retreat sometime in the 1730s, the springs were acclaimed long before others in the region. When sixteen-year-old George Washington visited in 1748, his notation that he had “called to see ye Fam’d Warm Springs” indicates that the retreat was already well known. He returned many times through the years and later employed James Rumsey to build him a summer home there, though Washington’s fame later prevented him from taking up residence in such a public place. Some sources claim that Rumsey built several of the present buildings at the spring, though these claims have not yet been substantiated. Along with George Washington, Samuel and John Augustine Washington also owned property in Bath, as the surrounding town of Berkeley Springs is officially known, and they helped plan its design and function. Here, too, the community qualifies as historically important as an early “planned development.” Parcels laid out by planners occupied quarter-acre lots, instead of the half-acre typically specified in state legislation. Scholars who established the town’s national historic district say this smaller lot size indicates that lawmakers acknowledged Bath would develop as a community of “second homes,” not year-round houses. These “second homes” also include “Berkeley Castle,” an elaborate stone cottage built by Samuel Taylor Suit on the ridge above the springs. Many other well-preserved homes of the Victorian period collect in the little vale about the town, and walking-tour brochures are available in the park and local shops and restaurants. Fortunately or unfortunately, the springs did not fare well against competition in the long run. Larger resort areas at Cape May and Saratoga Springs eclipsed Bath, and by the 1830s springs in southern Virginia began to win fame that drew bathers away. In addition, the town suffered a series of fires and other calamities that impeded its growth. In many ways, though, this helped the springs maintain a rural charm in which big-city visitors now delight. 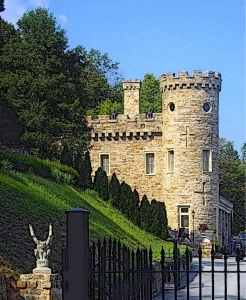 By some estimates more than a hundred cabins and country inns are located in the springs region, and little wonder: a drive of less that two hours from Baltimore and Washington, the community is an ideal retreat for more than nine million metropolitan residents who have had their fill of urban living. 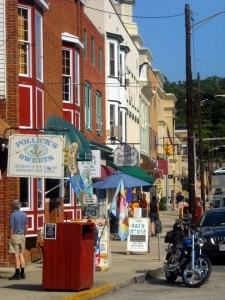 In addition to its historical and therapeutic amenities, Berkeley Springs is an ideal destination for shopping and dining. Specialty shops and idiomatic restaurants are located throughout the area and offer all that the vacationer could desire. Scenic wonders also abound, and I recommend a visit to the Prospect Peak overlook, just west of town, offering a panorama of the Potomac Valley, and to Cacapon Resort State Park, some ten miles south, from which another scenic vista eastward to the Blue Ridge may be enjoyed.